The President of the Pontifical Commission for Vatican City State is the leader of the Pontifical Commission for Vatican City State, the legislative body of Vatican City. As a senior member of the Roman Curia, the President is normally a cardinal of the Catholic Church. The President is appointed to a five-year term by the Pope. 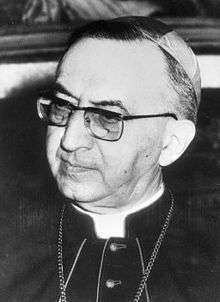 The holder of the office has since 2000 concurrently held the office of President of the Governorate of Vatican City State, which is distinct from the former title of Governor of Vatican City. 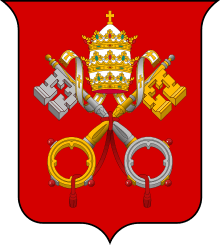 In addition to his legislative role, the President of the Governorate of Vatican City State is delegated executive authority for Vatican City by the Pope. Administrations and departments of Vatican City's government, including the Corpo della Gendarmeria, the Vatican Observatory, the Vatican Museums, and the Department of Pontifical Villas (which administers Castel Gandolfo) report to the Governorate. 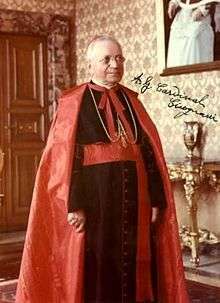 The current President is Cardinal Giuseppe Bertello, appointed to the position by Pope Benedict XVI on 1 October 2011. 1 2 Pope John Paul II (26 November 2000). "Fundamental Law of Vatican City State" (PDF). Retrieved 2007-10-11. ↑ "Legislative and Executive Bodies". Office of the President of Vatican City State. 2007. Retrieved 2007-10-11. ↑ "Administrations and Central Offices". Office of the President of Vatican City State. Retrieved 2007-10-11. 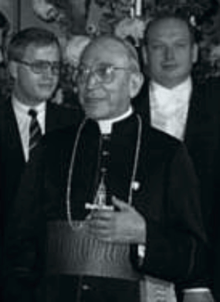 ↑ Pope John Paul II (22 February 1996). "Universi Dominici Gregis". Retrieved 2007-10-12.